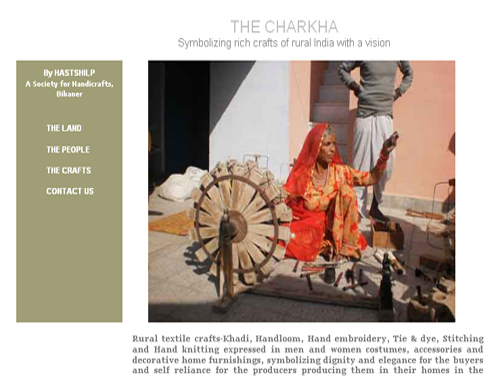 This projects for rural textile crafts-Khadi, Handloom, Hand embroidery, Tie & dye, Stitching and Hand knitting expressed in men and women costumes, accessories and decorative home furnishings, symbolizing dignity and elegance for the buyers and self reliance for the producers producing them in their homes in the villages spread across India, once revived and promoted by Mahatma Gandhi. In this projects Charkha (spinning wheel) is a very familiar, commonly found thing in every house in India and it says a story which is of the time of pre-industrialization. Charkha had a very important place in Indian culture at that time. It represents the rural culture in which the people had producing power with them. They used to manufacture and distribute the things which are essential for life, in their own houses. Land Page describe the real land of bikaner. People page describe the people who make and use handmade products only. The Crafts page show handmade products pictures and descriptions. This projects describe “Industrialization is a dire curse which has given few the power to ride the back of many, and there is men’s greed behind it” was invented and said by M.K. Gandhi. For non-violent resistance of industrialization, he introduced the philosophy of Charkha and that’s why his name is permanently associated with it. The Charkha is a symbol of that old rural culture, its philosophy and beautiful handicrafts which are now taking their last breaths in the villages of India.